Emphasizing the subject. That’s the main goal people have when they use the Radial Filter. 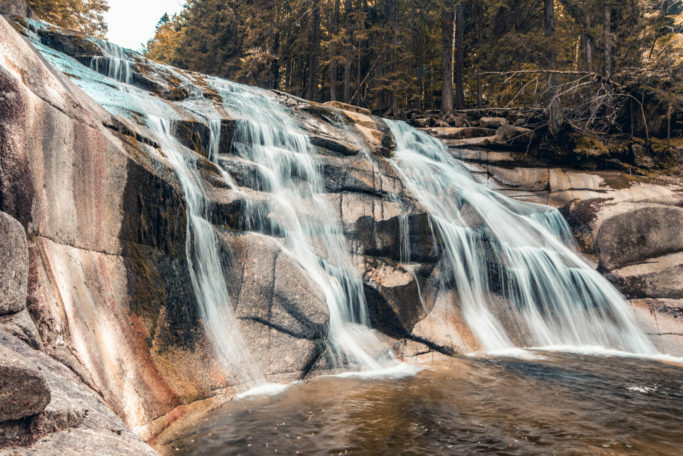 But it actually has many other uses too—for things from editing just a selected part of a picture to adding color effects. 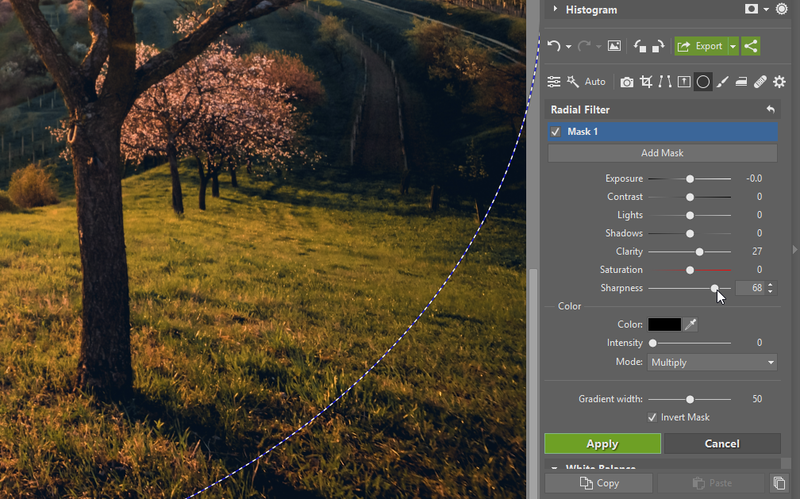 Join us for a look at 3 common edits where the Radial Filter will help. 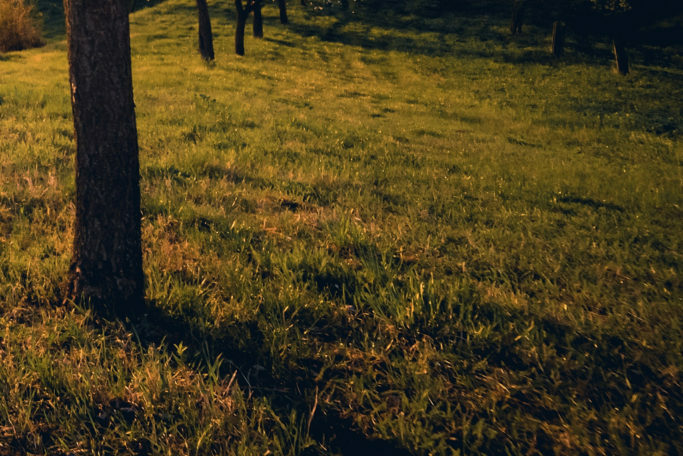 The Radial Filter is one the tools in Zoner Photo Studio X. You’ll find it in the Develop module. It’s used for adjusting just a selected part of a photo. 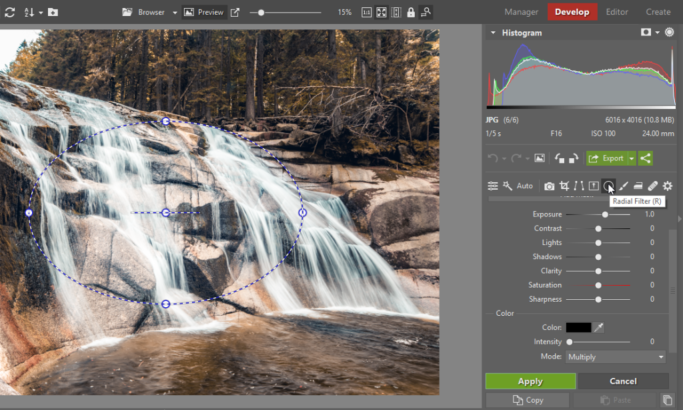 You can use it to fine-tune exposure and sharpness, adjust colors, and more. And that in turn gives you quite a few possibilities. Normally you’d add vignetting in the Develop module by using the Vignetting item in the Effects menu. But if you need more flexibility, the Radial Filter is here to help. 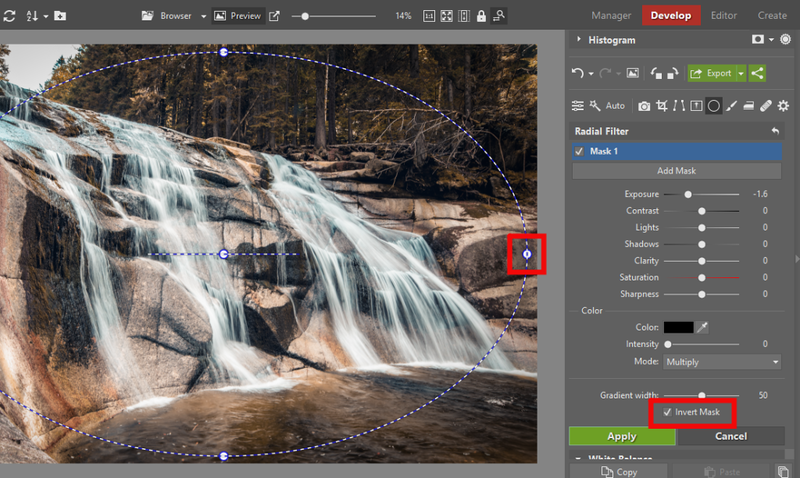 To work with it, first click its button on the right, or press U.
You’ll find the Radial Filter tool in the right panel. 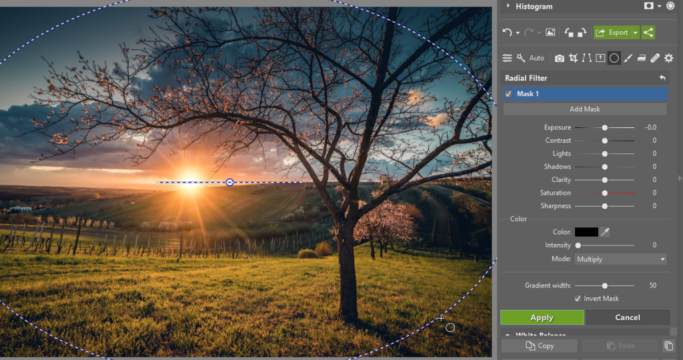 Use the Radial Filter to draw an ellipse. Then click and drag its guidepoints until that ellipse is almost touching the picture’s edges. Where exactly you put that ellipse depends strictly on you and on the photo. The center of the Radial Filter doesn’t have to be in the center of the photo, if that wouldn’t be a good fit for the photo. Once you’re satisfied with its placement, turn on the Invert mask option. The filter’s effect is then applied outside of the ellipse, rather than inside of it. Then just lower the Exposure to darken the corners. 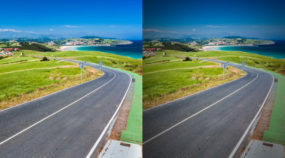 You can also tweak a few other settings as needed to get the vignetting looking just right. Vignetting added using the Radial Filter. Many lenses have a problem with blurriness in the corners. You can’t eliminate this problem on a PC, but the Radial Filter can at least reduce it. Set up the Radial Filter to affect the corners. Just like with vignetting, start by creating an ellipse that covers most of the photo, and turn on Invert Mask. Then zoom the photo in to 100%, so you can really see what your edits are doing. Finally, raise Sharpness, and if needed Clarity as well, to make the corners look sharper. Your specific values for both of these will depend on how much you want to sharpen. But remember that just like with every edit, you shouldn’t sharpen too much. Otherwise the picture won’t look natural. Also, when you publish a picture online, most people won’t notice blurriness in the corners. But for large prints or at 1:1 zoom, it will be visible. So some sharpening is useful. Invert the mask and sharpen the corners to suit your taste. Corner sharpness before and after the edit. Photos with the sun in them can be another interesting place to use the Radial Filter. That’s because you can use it to emphasize lens flare. You just have to give the filter the right color. Give the Radial Filter a size and position that put it right around the sun. In the Color section, enter your desired shade of orange for the sun. Set an suitable Intensity (in the picture below, for example, it’s around 30). Switch the mode to Screen. And max out the Gradient width, so that the effect is maximally smooth. Then just click Apply to confirm the effect. Highlighting the sun in orange. 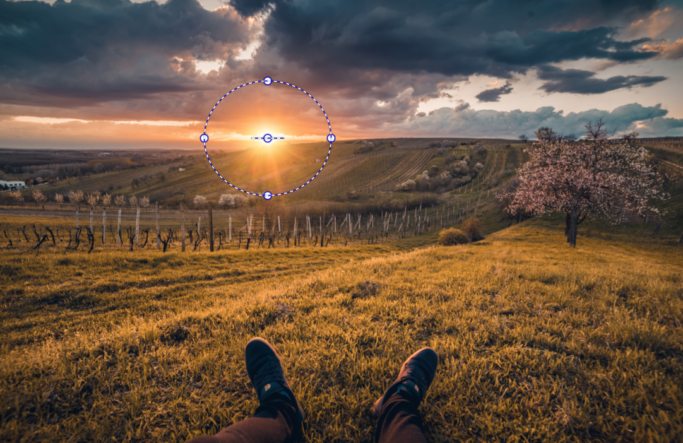 There are definitely many more ways you can use the Radial Filter. It’s all up to your creativity. 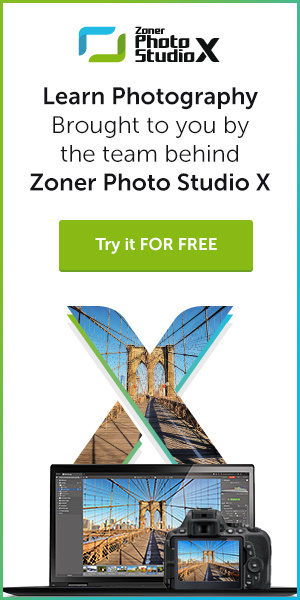 So download Zoner Photo Studio X, try it free for 30 days, give the Radial Filter a test drive, and then come back to brag a little about what you’ve done with it.